Bill Simon sits in his office at his Hermosa home. Simon retired after more than 20 years as a coordinator of the Animas River Stakeholders Group. After more than 20 years as a coordinator of the Animas River Stakeholders Group, Bill Simon was about to retire when he received a call on Aug. 6 from a friend who said he should take a look at the Animas River. “There’s enough people that know my phone number to get in touch with me when something goes wrong with the river,” Simon said. He immediately left the office in his Hermosa home and went to the Trimble Lane bridge, where the river ran its normal shade of blue. He went further north to Bakers Bridge, and the usually scenic lookout had transformed as the Animas River oozed an orange sludge. The days that followed were filled with an endless stream of phone calls, emergency meetings and a lot of misinformation and unknowns. It became apparent retirement would have to wait for Simon, who dedicated his life to fixing problems caused by decades of mining in San Juan County. That didn’t bother the 71-year-old Simon. He’s never been a person to sit idle. In the 1940s, on the high plains between Loveland and Berthoud, Simon’s father tried farming, which “didn’t work out so good,” Simon recalled. His father eventually went back to machining, starting his own business that profited off of making specialized parts for satellites. At age 9, Simon leased the ranch from his father, turning the farm into a profitable operation. He saved money for college, in time earning a skiing scholarship at the University of California-Berkley. Simon arrived on campus as the heated civil rights and free speech movements collided with Vietnam War protests. He was involved in some of the movements while trying to study a range of scientific fields, but ultimately was overwhelmed by the social unrest. He moved to Colorado in 1970 to “hide out,” but not for long. For almost 20 years, Simon worked for mining companies, assisting with exploration and development of the industry. But his true calling was remediation work on the impacts of the mining industry. “When I got to Silverton and started working for the mining companies, I was bulldozing roads here and there, and the mining companies would walk away from them, leaving their trash behind,” he said. “My passion in life is farming and growing plants and trees. So I started doing that without getting paid for it. It was just a good way of leaving the job site clean, restored as much as possible, planted, that sort of thing. In 1994, Simon played a major role in forming the Animas River Stakeholders Group with the intent to bring all local, state and federal agencies, as well as interested individuals, together to improve the river’s water quality. The group, throughout the years, has been funded by an array of contributors, including the Environmental Protection Agency, state and local agencies and mining interests, as well as tireless grant writing by Simon, who, in more than 20 attempts, has never had an application fail. Simon picked a monster to fight. The mining district north of Silverton is one of the most highly mineralized areas in the country, and the heavy mining activity throughout the 19th and 20th centuries exacerbated acidic discharges into the Animas watershed. The state and EPA set out to impose water-quality standards that didn’t take into account this natural loading of heavy metals into the waterways, Simon said. So, local researchers embarked on an extensive project to monitor the Animas and its various tributaries. The stakeholders group identified 34 mine waste piles and 33 discharging portals that accounted for 90 percent of the metal loading in the basin, and drafted a 20-year plan to improve water quality. At the time, the stakeholders group was an alternative to the EPA’s Superfund, and the presumed stigma the designation brings with it. The EPA and state allowed the group to spearhead dozens of mine cleanup projects in the Animas River Basin. The lack of legal protections for third parties, which proposed good Samaritan legislation could address, has kept local groups from addressing discharging mines, which is why the EPA launched several projects in and around Gold King mine. The stakeholders group is just about done with its doable projects in the Silverton caldera, and now, with the looming possibility of the EPA’s cleanup program – Superfund – the group’s role in the mining district may further diminish. The stakeholders group has a laundry list of successful remediation projects, including bringing Mineral Creek up to water-quality standards and nearly achieving that goal in the Upper Animas River. Despite that progress, because of flows into Cement Creek the overall health of the Animas has declined in recent years. These days, Simon keeps busy around his lush property that backs to Hermosa Creek. 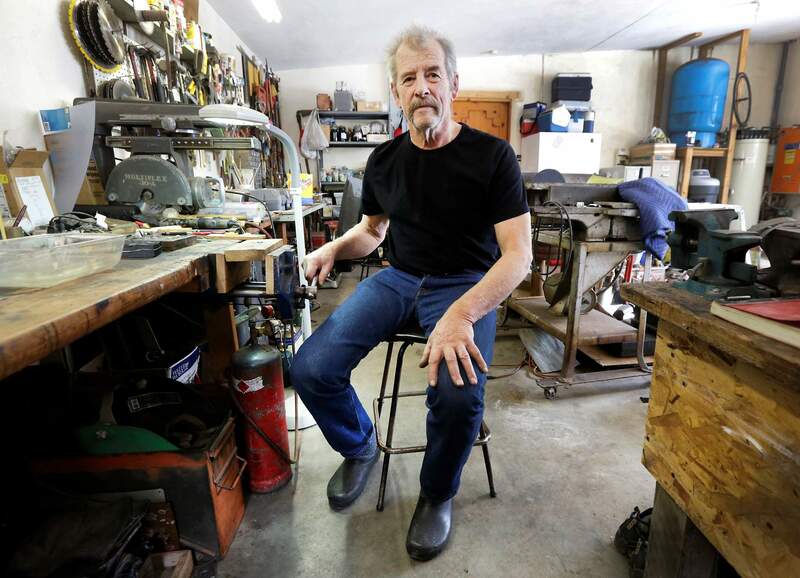 He tends his flock of sheep and lambs, apricot orchard and a couple of big gardens, builds furniture in his garage and is learning a new trade: jewelry-making. He has had Parkinson’s disease for 10 years, but his mind hasn’t slowed, and his wit is sharp. He speaks ploddingly and slowly, careful to enunciate each word, and has increasing difficultly walking around. Simon announced his retirement in October, and has passed most of the workload onto fellow coordinators Peter Butler and Steve Fearn, who’ve also been with the group for more than two decades. Simon continues to pore over new mine waste-treating technologies, excited as ever at the prospect of finally reaching the standards set years ago. He said he believes the endpoint for treating the Animas includes a variety of factors, the best indicator of which is at least one trout species surviving as far north as Silverton, and perhaps beyond. But, Simon said he hopes his life’s work will extend beyond the Animas River Basin. 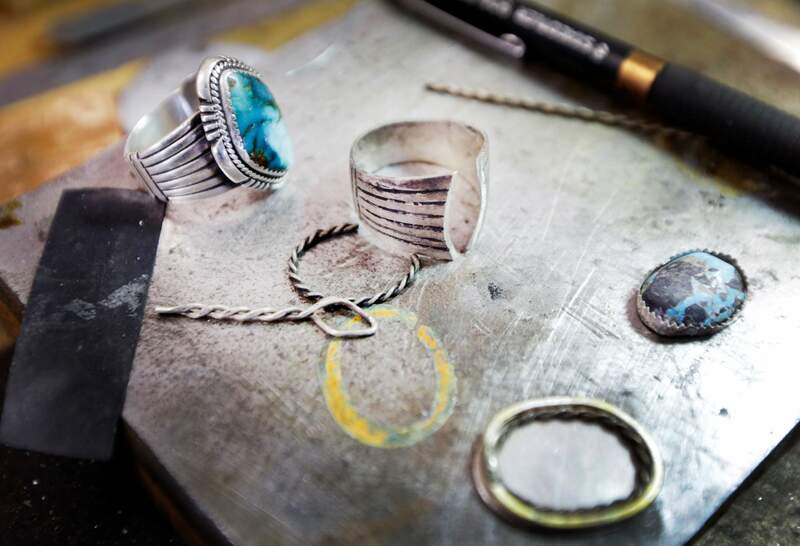 Bill Simon has taken up making jewelry at his Hermosa home. Simon retired in October 2015 after more than 20 years as a coordinator of the Animas River Stakeholders Group. “I’ve collected so many rocks over the years that I decided it was time to do something with them,” said Bill Simon, who had planned to retire in August 2015 as coordinator of the Animas River Stakeholders Group. The Gold King Mine spill forced him to delay leaving until October 2015.